Suzanne Somers appeared on Oprah today and discussed her use of bioidentical hormones which she has sustained for a decade. Not surprisingly, this fountain of youth can be obtained through extensive time, effort, and cost. Yip, that sounds realistic for the average woman. 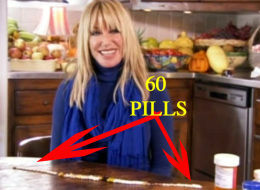 60 pills daily? Sure. Estrogen daily? Bring it on. Progesterone two weeks a month? Check. A husband to make me my smoothie each morning to choke down those pills? Yup. Somers invited cameras into her home to show her daily routine, seen below. First she rubs hormone lotion on the inside of her upper arm, always estrogen and two weeks a month progesterone. She then injects estriol vaginally, which she did not let cameras see. 2. Double-standard: her husband doesn’t seem too tripped out about his age and he looks FAR older than she does. Puh-leez, Angelina. I'm tired of the (unrealistic) baby weight reports. In this week’s Us Magazine, we have yet ANOTHER story of success: a new mother of twins sheds all her baby weight after a mere 11 weeks. How did she do it, you ask? Oh, ya know, it’s just an illusion created by a “good dress.” Oh, and by receiving deliveries of assorted Asian fruit and vegetables, mussels, crabs and prawns. No exercise, though. Nope. Just good genes and the usual claim: breast feeding! Salma Hayek spoke out against this myth. As she said to Oprah, “The only way women lose weight this way is by not eating AND breast feeding…and this is bad for the baby.” Amen, sister. The emphasis on unhealthy, often deadly, thinness is bad enough but to add that same pressure on pregnant women and new mothers moments after delivery is ludicrous! This signals an unhealthy and potentially dangerous trend by creating unrealistic expectations for ordinary women that don’t have the time of the means to devote their all of their energy to weight loss. Not to mention, even with the time and money, baby weight gain is not designed to fall off immediately. No matter who you are (Nicole, Angelina, Jessica, Katie). Bump watch has taken over the tabloids in a furious and obsessive way over the last few years and includes the intense scrutiny and public commentary on how much weight pregnant celebrities gained and how much they lost soon after birth. Salma Hayek was absolutely chastised for not losing her pregnancy weight immediately after her daughter was born. which is one of the reasons she chose to publically address this craze on national television.